IN spite of the much publicized break-up mêlée Irekefe Obareki (Kefee) has been honoured with the prestigious International Young Ambassador for Peace Award at an event which held in Lagos recently. "I am really excited and happy to get an award like an Ambassador for Peace," Kefee gleefully remarked after receiving her award. "To me right now, it is something that came at a time when I need some encouragement. And I'm happy people still see what I do, and appreciate me." She received the honour due to her involvement with Peace initiatives through her are her foundation, Kefee's Peace Foundation which organized a free Peace Concert in the Niger-Delta where artistes like Sunny Neji, and Faze were headline acts. The success of the event motivated Kefee to not just limit her love foundation to the Niger Delta but to spread the message of peace, love and unity through out Africa starting with her people. "I guess the organizers, have seen my works," Kefee presumes. "They called to tell me to come pick the Award because they like what I was doing. They love my music, they love the charity works I am doing, and all that. "I am from a Niger-Delta region which is a restive region. And we are trying our best in that region as well to make sure there is peace. Kefee's first assignment as a Peace Ambassador is to be part of the Performing-Act delegates to the Global Peace Festival, which will be hosted by Nigeria from March 1-3. The event will host delegates from 70 Countries. The Ambassador for Peace is an initiative of the Universal Peace Forum, an NGO in special consultative Status with the Economic and Social Council of the United Nations. 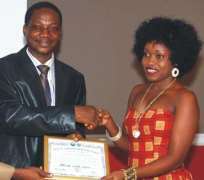 In Nigeria, the awards are organized presented by UPF's affiliates, Youth Federation for World Peace. Past winners of the Award include: Keke Ogungbe, D'banj, and Tuface Idibia.